Hello Beauties! First of all, let me just apologise for my little disappearing act this week. I've really been struggling to keep up with my Uni work as I have four major deadlines all on the same day (and I don't have a clue what I'm doing for each of my essays!) so blogging has had to take a back seat. I haven't had any time to take blog photos yet (I plan on getting up super early to do this tomorrow) but I just thought I would share a quick and rare OOTD with you. Sorry for the terrible quality mirror pics, fashion blogging isn't my forte. Now that the weather has taken a colder turn with all this horrible wind and rain we've been having, It's about time I made use of all of the Autumn clothes I've been buying over the past few months. I decided to wear this black jumper dress that I got from Primark today as its cosy but not too thick as it wasn't all that cold today. I spent ages looking for a black jumper dress this year and I never expected that I would find my perfect one in Primark! It's the perfect length for me, not too short to wear in the day with some thick black tights but not too long that I look like a granny either. They also do this in grey and pink and it only cost me £10, if anyone is interested it. I paired it with thick black tights and some black chunky ankle boots which I picked up in Next last year. 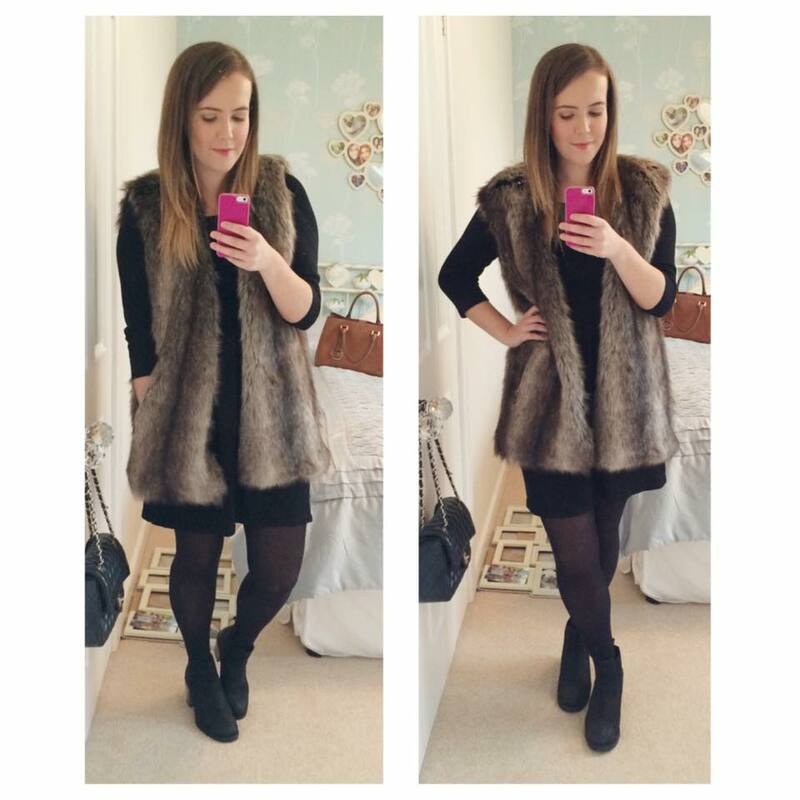 To finish the outfit off, I paired my jumper dress with this beautiful faux fur vest from Zara. I love anything fluffy and this vest is just so snuggly and the extra length makes it look so chic. I think Zara also do this in other colours, but the link to the one I have is here. I hope you liked this quick OOTD and please let me know in the comments if you'd like to see more! I promise to get some of my normal posts back up soon! Such a lovely outfit, that Zara vest really completes the look. I love the fur vest, it looks so cosy! Omg i am in love with fur this season, gorgeous outfit! Gee I went to Zara yesterday and didn't see this :( So lovely! Fur vests are so cozyyyyy! I really like ones that cover my bum so I can wear leggings with it, great pick!